I'm beyond excited to announce the launch of my new website! This has been a labour of love for many months, and I finally feel like it's ready to serve. There are still a few kinks here and there that need to be sorted out, but honestly, there can never be perfect. I don't do perfection here at The Petite Co.
After struggling with crippling anxiety and depression for the better half of 2016 and 2017, I decided to consciously pare down my workload, my client list and my expectations of myself. I was living a long, tired life of trying to prove myself to others and trying to stop replaying conversations in my head, telling me where I went wrong, or where I wasn't good enough. So The Petite Co. doesn't do any perfectionism here. We do enough. At the heart of The Petite Co. lies a passion for serving from a full cup, and celebrating all our unique paths. My goal is a well-lived life and a well-loved brand, not only for myself but also for you. It is a call to stop chasing after someone else's dreams, to tell a good story with the one life we get, and to live out your legacy. The Petite Co. is focused on helping you craft carefully curated brands and businesses, so you can focus on what matters, work in your genius zone, and amplify your impact right now. I knew I was transitioning into another level and season in my business and life, and I was filled with so much joy and hope I knew that I wanted to refresh, but not change, my brand identity, which was still very much me. The moodboard was mostly neutrals with a pop of colour, classic patterns and nature elements that really represented what The Petite Co. stands for: classic, timeless, kindness and always growing. I updated the logo just a tiny bit, altering the "The" and "Co" font just a bit to make it more modern and unique. I switched up my original brand colours for a more muted, neutral palette with a pop of pink. 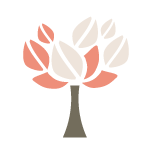 I drew a tree as an alternative logo, replacing my previous alternative logo, because it just elevated my brand and showed more of what TPC is actually about: growth. Then, I hand drew some leaves and florals to complement the new brand, and matched them with a natural-grained dark wood and a subtle watercolour texture. Funny thing when your brand is so you - the coworking space I just signed up to work with has similar palettes and furnishings! This is the final mock-up for the website, and the actual developed version on Squarespace actually turned out very similar! I wanted a sense of calm and ease for visitors when they landed on my website, and to make it easy to find everything they need, from services to free resources. Over the next few months, I'll be tracking analytics to see how well this works. I did have to make a small adjustment at the bottom footer, just to make everything look more balanced, but that's about it. Thank you for walking through this chapter with me and being here for the launch! I hope you enjoy the new website, and let me know what you think of it, too. Leave a comment below to let me know what you're currently struggling with or have struggled with and what you have tried to get out of it.